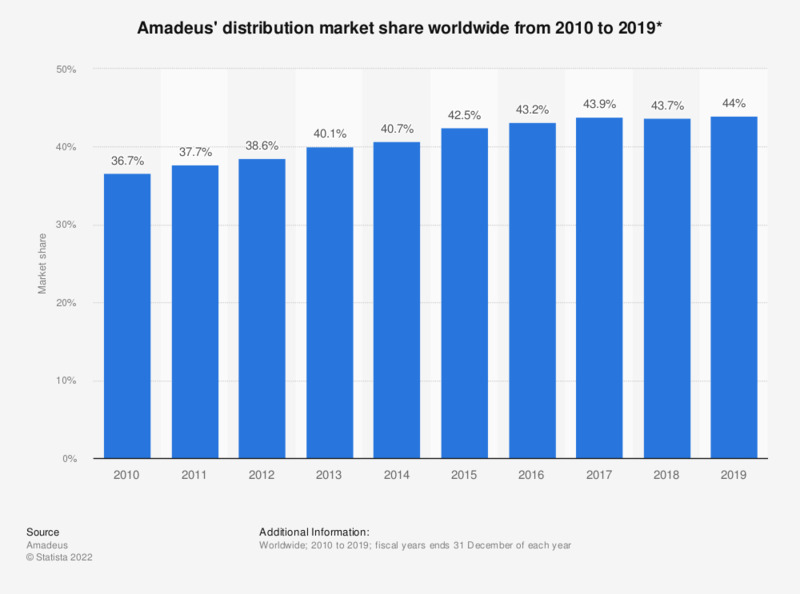 This statistic shows the Amadeus distribution platform market share of global air travel distribution systems from 2010 to 2017. In 2017, the Amadeus held 43.9 percent of the global air travel distribution systems market. In 2017, the revenue of Amadeus was 5.81 billion U.S. dollars. The source provides the following information: "Market share is calculated based on the total volume of travel agency air bookings processed by global or regional Computer Reservation Systems (CRSs). It excludes air bookings made directly through in-house airline systems or single country operators, the latter primarily in China, Japan, South Korea (until the migration of Topas’ connected travel agencies to Amadeus at the end of the third quarter of 2014) and Russia."